Baba Yaga is a text that is read, studied, told, adapted, interpreted and reinterpreted differently at different times. 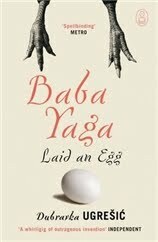 Dubravka Ugrešić’s Baba Yaga Laid an Egg is another addition to the Canongate Myth Series, which is devoted to “bold retellings of legendary tales”. I’ve been following the series for some years now, and so I wanted to read this book for that reason alone. But my interested in Ugrešić was rekindled a few months ago when the book won the James Tiptree, Jr Award, “an annual literary prize for science fiction or fantasy that expands or explores our understanding of gender”. Baba Yaga Laid an Egg is only a retelling of a myth if we use “retelling” in the broadest possible sense of the word. The book is divided into three sections: the first (my favourite) tells the story of the narrator’s relationship with her ageing mother, who has been diagnosed with dementia and doesn’t have long to live. The much more bizarre section two is about three women, all of whom would be considered older (but who are in fact of very different ages), spending a holiday at a spa abroad. Finally, section three is not a story at all but a long essay, written by a folklorist we meet in section one, about the myth of Baba Yaga and its relationship with sections one and two of the book. If that sounds unusual, it’s because it is. Baba Yaga Laid an Egg is a daring book – it’s the kind of book that doesn’t so much break as bulldozers the fourth wall; the kind of book for which the terms “metafiction” and “post-modern” were invented. Although highly experimental fiction of this sort can go either way for me (see my reaction to The Helmet of Horror, also part of the Canongate Myths series), Ugrešić’s take on Baba Yaga really worked. Her playfulness was what did it – I can’t imagine a novel like this grabbing me if it came across as taking itself too seriously. Fortunately, Baba Yaga Laid an Egg is full of irony and humorous asides. This passage put me in mind of Charlotte Perkins Gilman’s Herland, whose male protagonists say at one point that they’re not used to noticing older women at all, though they suppose they must also exist outside of Herland. But as they don’t want anything from them, their existence fails to register at all. Throughout the book, Ugrešić makes this invisibility obvious by exploring the “variants in the typology of old women”. Her characters all face the same powerlessness and invisibility even though they have little in common other than the fact that they’re over a certain age. In part two in particular, she begins to differentiate her three protagonists as characters as the story progresses, leaving the reader to consider why we initially saw them as belonging to the same type. As for the essay section, I enjoyed it for what it says about stories and ideology, even if it’s not clear how much is to be taken at face value. It was also an interesting reflection on the role, ambitions and shortcomings of literary criticism. Despite the very playful tone, I thought it achieved an interesting balance between an appreciation of the storytelling tradition being described and thoughtful criticism of what the fact that we tell these stories (and the way we tell them) reveals about the roles we see as permissible for women over a certain age. I’m not quite sure if this is what Ugrešić was going for, but in any case that interests me less than what the book communicated to me. Baba Yaga Laid an Egg may not be for everyone, but it certainly did expand my understanding of gender roles, age, and the intersection between the two. If that’s something you’re interested in, by all means do pick it up. I'm not familiar with the Cannongate series but I love reading short stories retelling fairy tales and myths, so I'll have to check it out. This book sounds fantastic - not exactly the sort of structure and story I tend to expect from retellings, but I'm curious to read it myself and see how Ugrešić pulls all these elements together. For some reason my library appears to be indifferent to this series and not really buying any of them... I have only managed to read the couple that I have bought. This one sounds interesting, so I probably will have to buy it one of these days. This sounds a-mazing! I'm jonesing for the Postmodern and experimental these days -- especially since finishing C. I've heard about this book here and there, but yours is most definitely the most thoughtful review I've read of it. Wonderful review, Ana! I liked the way Ugrešić (how do you pronounce the 'š' and 'ć' in her name?) has structured the book - having two independent stories in the first two sections and having an essay in the third section which links the previous two. The book looks quite experimental and it also looks like Ugrešić is extending the definition of what a novel is. She looks like an exciting new writer to me! I also like the topics that the book addresses. I will add it to my 'TBR' list. The Canongate myth series looks interesting! I kind of have to agree with Jill. I think it would be sort of depressing to read about the invisibility of older women, but have heard on more than one occasion that women over a certain age are pretty much overlooked and underestimated in society. Not something that I care to think too much about as I get older, that's for sure! I've been wanting to read this one for some time now. I have read and enjoyed Ugrešić's book of essays Nobody's Home. I have Ministry of Pain and Thank You for Not Reading on my bookshelf. Baba Yaga is good! I've been reading the Myth series too, but I haven't read as many of them as you have. Girl meets boy also dealt with gender (if I remember correctly), though I didn't really like it... I'm sorry you didn't like Helmet of Horror, I actually really enjoyed that one. I keep looking for Baba Yaga when I'm at the bookstores, but never see it. Your review has renewed my urge to find this book, though I'll probably be reading Binu soon. I have to admit that the title and the cover captivate me. I'm not sure I like the subject matter (the invisibility of older women) even though it is a fact of life. My ignoring it won't make it better, though, so I should probably read about it. Very interesting. I've been thinking about these issues lately, both in the context of getting older myself and while changing the way I think about my Mom. It's so sad that older women being ignored is the reality. It wasn't always like this, there was a time when they were respected. I've read a few of this myth series and have really enjoyed the series overall with some books being better than others. Unfortunately this is not one of the books that my library has. I must go back to the catalogue and see which books in the series they have that I haven't read yet. I haven't read any from the myth series. I didn't even know it existed, although I've heard of a few of the books within it. I love that your blog always brings books to my attention that I would have otherwise not known about. The structure of the book sounds really interesting. What a fascinating issue to confront. I've never really thought about it, but our society in general does in fact treat older women as if they are a homogeneous group. How awful. I'm interested to check this one out. Thanks for the great review as always! Ellen: I'd love to hear what you think of this! I'm also a huge fan of myths and fairy tales retold, so the day I discovered the Canongate series was a happy one. Kelly: That's too bad :( My library sadly also doesn't have them all. Other Kelly: You are too nice! I think Ugrešić achieved all those things extremely well. Andi: Aww, thank you! I'd love to see you review this one, so I hope you get to it sometime. If you're in the mood for experimental, this will certainly fit the bill! Vishy: Ha, good questioning about how her name is pronounced - I actually have no idea either :P But anyway, yes, she certainly does expand the definition of a novel with her structure. I actually hadn't heard of her until I picked this up, but I'd love to see what else she's written. Amy: I'm not sure how, but she does make it work better than most, doesn't she? Zibilee: Like I was telling Jill, the book is serious but surprisingly not bleak! Stefanie: This is the only book of hers I've read to date, but I'm definitely curious about her others! Kathy: I think I probably made the book sound more depressing than it is. It does take its subject matter seriously, but there's also a lot of hopeful defiance in there. Joanna: I do wonder about the historical roots of this. Probably impossible to trace, but still interesting to think about. Bina: I actually know very little about her, but that's going to have to change! Marg: Same for me - some hits and some misses, but I find the series as a whole so fascinating. Sorry to hear your library doesn't have this! Kristi: Aw, thank you for the kind words! It makes me very happy to have you introduce you to the series _ I hope you'll enjoy it as much as I have. i just read my first Canongate for Dolce Bellezza's Penelopiad readalong, and i really really enjoyed it. i hadn't even heard of the series before that, but now that i know, it seems everyone has known about them for so long! i'm glad to see this reviewed, and it looks wonderful. i'll be checking to see if my library has it available.